Cartagenský - Hostelů v Cartagenský. Mapy pro Cartagenský, fotky a recenze pro každý hostel v Cartagenský. Hledáte - Hostel, levný hotel, apartmán, pokoj, chalupu, pokoj se snídaní B & B, nebo ubytovnu - Cartagenský? Už nemusíte dál hledat, všechny dobré ceny pro následující město: Cartagenský jsou na Hostely.com. Tak jako tisíce lidí každý měsíc, zarezervujte si vaše ubytování bezpečně za nejlepší cenu ve všech čtvrtích - Cartagenský. Na této stránce můžete jedoduše najít hostel v centru, univerzitní studentské čtvrti, v blízkosti autobusové zastávky, nádraží, letiště a blízko všech atrakcí - Cartagenský. Getsemani is a great choice for travellers interested in culture, architecture and city walks. This is our guests' favourite part of Cartagena de Indias, according to independent reviews. 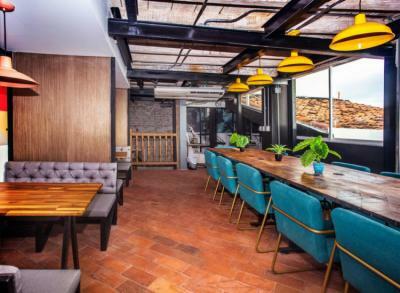 Situated in the oldest center of Cartagena, 600m from Cartagena's Gold Museum, Casa Chipi Chipi Hostal has a terrace/pation and rooms with free WiFi access. 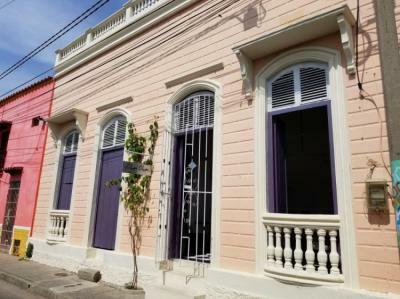 In a prime location in the hip Getsemaní district, the property is set 600 m from Bolivar Park and an 8-minute walk from Palace of the Inquisition. Residential and commercial neighborhood The tour desk can provide information about the area. The bus terminal is 35 minutes away by car. We stayed for 2 nights, and we plan to come back. Such a great experience. We just started staying at hostels, and so far, everything's been great. We would recommend this place, its clean, good location and price, kind and helpful hosts, with great food. Nice location, delicious food, great staff, clean and comfortable beds, clean bathroom with good water pressure. Thankful! Day trips from Cartagena will take you to some of the area’s most pristine sandy strips. Head off the coast to the beautiful Islas Rosario for the day, or go to nearby Playa Blanco. Try your hand at scuba diving, taste the flavors of the city’s street food, or take a crack at kitesurfing. Bocagrande Beach & Marbella Beach, Centenary Park, Santisima Trinidad Church, The Coches Square, Cartagena's Pegasos's Wharf, Cartagena's Modern Art Museum Rafael Núñez International Airport - 10 mins away. Hostel Caribe Cartagena is 600 meters from San Felipe de Barajas Castle and 1.1 km from Cartagena City Walls. Rafael Núñez International Airport, the nearest airport, is 3 km away. Its a nice hostel. Some staff are really nice, others were ok. But, the room and facilities were all great. We enjoyed the plunge pool and rooftop resto/bar. They do serve good food too, and the property is clean. one of my favorite! 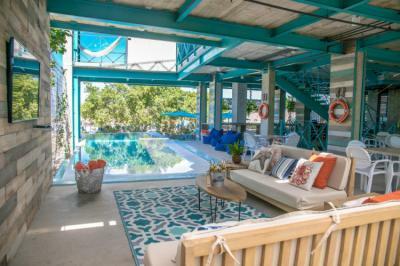 Great amenities - pool, roof terrace, air conditioned common areas, kitchen, friendly and helpful staff, daily activities, located in the old city, great vibes, and clean. I've read about the property and they were not exaggerating. I am in love. The staff are treasure, so kind and genuine, and helpful. Pool area and resto are fab. Great food, great location, great price, one of the best! Very clean rooms, close to shops, awesome staff, really yummy food. They are just extra in many ways. I already want to go back. 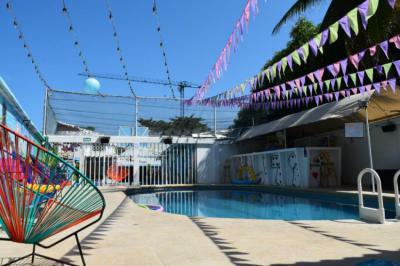 Wonderland Party Hostel is located in Cartagena de Indias, 3.5 km from Steps of La Popa Mount. The property is situated 3.7 km from Cartagena's Walls. San Felipe de Barajas Castle is 3.8 km from the hostel, while Bolivar Park is 5 km from the property. The nearest airport is Rafael Núñez International Airport, 1 km from the property. Great location! Walking distance to the airport, and quick and cheap ride to the city centre. Awesome swimming pool, parties, working wifi, good breakfast, ping pong table, bar, tv room, and kitchen. 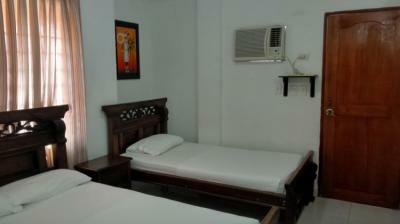 The hostel is very clean and the staff are very helpful. I enjoyed my stay here so much!! Everyone was helpful and kind. Love the pool and the chill vibes. They offer cheap but good food. Met a lot of people here, who were really cool too! The atmosphere is great with a positive and upbeat vibe. The property is charming and the location is incredible.Awesome hostel located in the heart of the old town. Each bed is a pod with its own light, several power outlets (US style), coat hook and a roller shade for privacy. 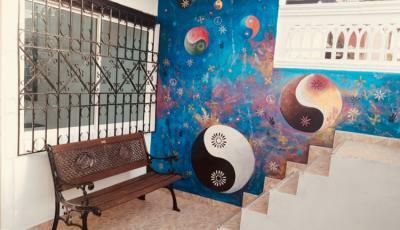 Stamp Hostel is located in a small town in front of the beaches, at 30 minutes From the Oldtown of Cartagena, 15 minutes of the international Rafael Nuñez Airport. The Hostel offers Shuttels from/ to airport and the old town with low prices. At 5 Kms you could find Ramblas mall where there is a supermarket, drugstore and other stores. Just one block from the hostel there is the church of the town. Brand new and beautifully designed. The place's future is bright. The pool, bathrooms and rooftop with jacuzzi, rooms, bar, jsut on point. They have a new building. Beachfront, and jungleback (yeah, made that word up). There's a Jacuzzi on the roof, and pool beside the bar on the ground floor. Outstanding staff, and wonderful food and drink. Definitely recommend. The hostel does provide your basic needs. I was literally just looking for a place to sleep and shower, and this hostel was able to deliver. I was always rested well (its quiet enough, and there weren't much people during my stay), the bathroom was clean, Im not sure about the towels and all, bc I always bring my own anyways. Location and price is perfect, for me. we stayed for a night. the room and bed were clean and comfortable enough. The location is good, and so is the price. The people were real nice, and the hot shower was working, so I wont complain.